November 10, 2014 by Ecommerce News. About Funding with tags Sweden. 2362 views. 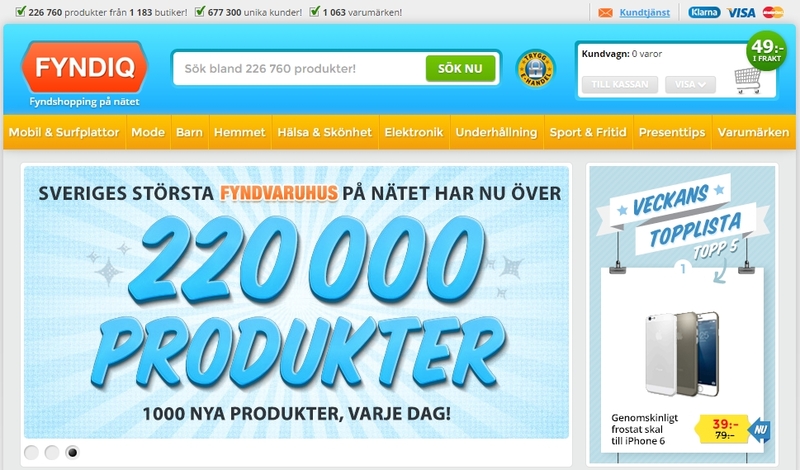 Fyndiq, a popular online marketplace in Sweden, received a 20 million dollar (€16.03 million) Serie A funding. Investors are Northzone and Industrifonden. Before this funding, Fyndiq has raised 4 million euros in funding from private investors. With the money, Fyndiq will continue growing in Sweden, as well as launching into new markets. Fyndiq is an online marketplace where customers can find good deals on products like electronics and household goods. It’s a platform where ecommerce retailers can list their products for free. Only if something gets sold, the Swedish company takes a 5% transaction fee. Products are shipped by the seller, so Fyndiq can focus solely on driving traffic to their site and maintain contact with the sellers. Fyndiq is ideal for ecommerce players looking to get rid of their slow-moving inventory. More than 500,000 unique customers have bought something on the Swedish marketplace and there are currently more than 220,000 products listed in categories like Mobile & Tablets, Fashion, Child, Home, Health & Beauty, Entertainment, Sports & Leisure, Gifts and Brands. Fyndiq’s television commercial from 2012. “I’m proud to announce that we have received funding from top-tier investors Northzone and Industrifonden to support our expansion plans. With their experience from scaling technology companies to game winners, we’re confident in our journey ahead and look forward to continuing our growth both in Sweden and elsewhere. The future looks bright for Fyndiq, our merchants and customers” said Dinesh Nayar, CEO & co-founder, in a statement. Fyndiq has launched in 2010 and grew from less than a million euros in sales in 2011 to almost 14 million euros in 2013, and its global goal is to become an “Amazon for bargain products”.